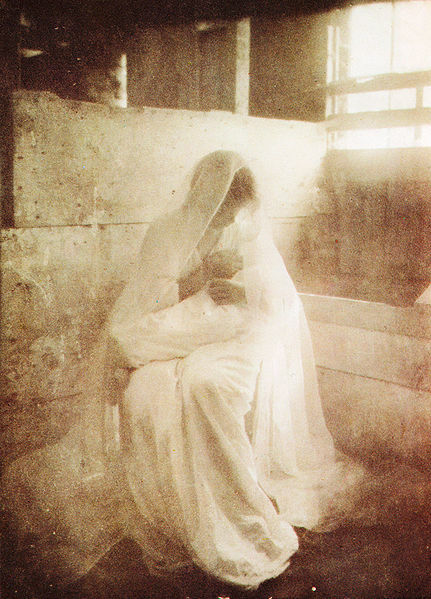 "The Manger" by American photographer Gertrude Kasebier (1852-1934). The other night I watched an episode of the TV series “Dragnet” that was originally broadcast on Christmas Eve in 1953. “Dragnet” was one of the first police shows on television, and it based all of its stories on cases in the files of the Los Angeles Police Department. In this episode, two detectives investigate the disappearance of a statue of the infant Jesus from the manger scene in a church in a largely Mexican neighborhood. The pastor of the church tells the detectives that the statue had almost no monetary value, and that he could replace it. But it had been in the manger every Christmas for decades, and the people of this poor parish would find a new figure hard to accept. The statue was returned in time for Christmas Day, and many Christians probably appreciate how important that was to the congregation. Many families, like those parishioners, consider their manger scene a part of their tradition, and no matter how chipped or faded the figures may become, they are unpacked every year and put in their accustomed place. Tradition plays a part in many Christmas observances, but this desire for continuity in the portrayal of the nativity is especially fitting. Because the practice of erecting a manger scene as we know it, is itself 786 years old. It was introduced by Francis of Assisi for a mass to be celebrated in Greccio, a hill town in Central Italy, at midnight on Christmas of the year 1223. Francis used living figures, including animals, but his tableaux was the model from which the manger scenes of today have evolved. He got permission from Pope Honorius III to create that display because he wanted to focus attention – including his own, he said – on the circumstances in which God entered the world in the form of the infant Jesus. He wanted to be able to visualize – and help other people visualize – the humility with which God, in the person of Jesus, began the journey that would lead to the salvation of the world. As a matter of faith, Francis and other Christians knew that God had put aside his divine nature – had covered it up, so to speak – and had taken on not only the appearance but the nature of a human being. Francis and other Christians knew intellectually that that was an astounding act of love. But Francis wanted to see for himself, and to show others, the full depth of that love that God had for his people – God, who did not come to save his people by overwhelming them or terrifying them, but by embracing them. Francis wanted to experience that love – wanted others to experience that love – on more than the level of theology and philosophy. And so he wanted to contemplate that improbable scene in which the Creator of the Universe, the source and cause of all that is, makes himself present not only in the form of a human being, but in the form of a poor, helpless infant – no wealthier, no stronger than the least of his own creatures. That child, when he had grown to manhood, would say that there is no greater love than to lay down one’s life for his friends, and Francis knew that act of love began in the manger where God first gave himself – literally – to mankind. Pope Benedict recently blessed hundreds of images of the infant Jesus that were brought to St. Peter’s Square by families preparing for Christmas. And as he gave the blessing, the pope recalled the inspiration of St. Francis. It is said that a teacher never knows where his influence ends, and St Francis, more than 700 years ago, cannot have known what he started. “The birth of Jesus in the stable at Bethlehem is where all my questions begin to be answered.